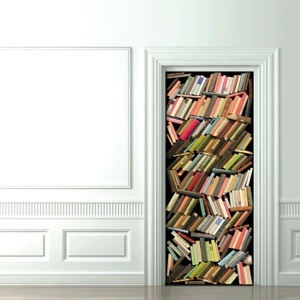 Take a look at this library idea. It’s for Kazakhstan’s National Library, and construction will begin soon. 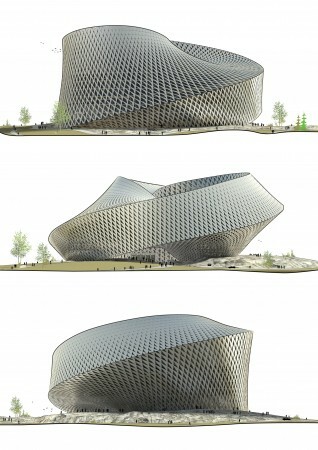 Yes, it’s a Möbius-shaped library! In the words of one commenter on teh Internetz, they can spend all they want on the construction, and none on the books, because all the books on the outside in the world is on the inside, too. MOAR pics and diagrams here. I had absolutely no plans to go to Kazakhstan, but I may have to rethink that, once this is finished. The narrow inside space, multiplied and complicated by mirrors, evoke a sensation of sublime terror, an alteration referring to a puzzling infinity itself created to destabilize conventional spatial habits. Mirrors become an instrument to create illusion and, at the same time, to unmask it. Since the public can easily see themselves reflected in a false infinite – thus discovering the illusion – the problem becomes the latency of perception. Ri-i-i-ght. 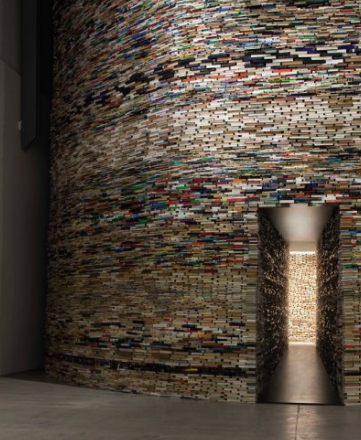 It’s just a big frickin’ tower of books. Remember fort parties when you were little? This is one EPIC fort party waiting to happen! You can see the gallery of pictures here.